I've seen a lot of people doing these types of blog posts and I decided to jump on it. I feel like if I make a list/write it down, it will motivate me to achieve my goals. I'll be following up with an update next month. 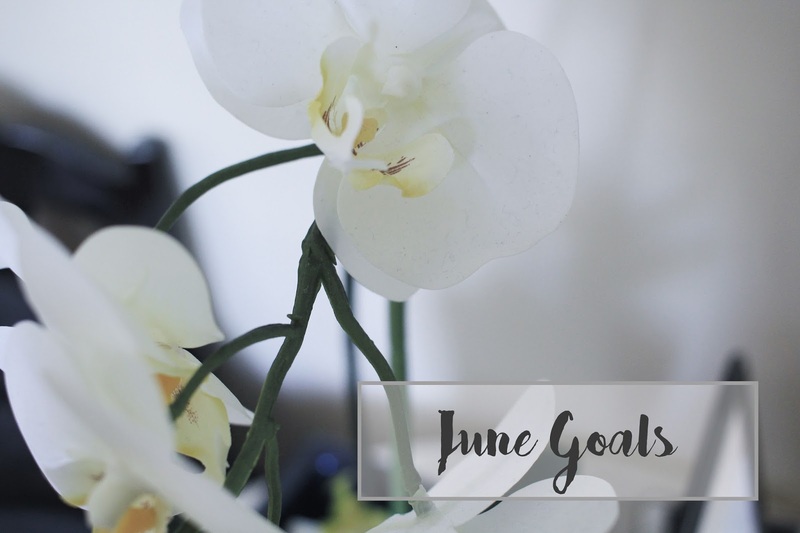 So, here are my goals for the month of June! These past few months, I feel like I've been eating way too much junk food. So this month I hope to start eating much more healthier. I actually downloaded an app called "My Fitness Pal". It helps me track my diet by keeping a diary of the meals I eat every day. I've only been using it for a week, but it's been really useful so far. This is something I always try to do every month but I can never do it! It's just so dangerous for me when I'm always at home and all there is to do is online shop. So yeah, hopefully this time I can actually do it. And I say "limit" because I know I won't be able to stop myself fully, haha. Sad to say, but half the year has just flew by! I've really been slacking on working on my family yearbook on Shutterfly (post). I know I'm going to have a lot of pictures to go through but I know I'm going to have fun bringing out my creativity and designing it. I don't know if anyone else does, but I love editing videos! Sometimes I like it even more than filming them. I may not be the greatest at editing videos but I just love working on it and seeing the finish product. It's just so rewarding. So yeah, I plan on making more videos! I've been putting this off for the longest time. I don't want to get a full on haircut, so just a trim. I just hate it when I go to the salon and they cut my hair way too short/shorter than I asked for. But this is something I've been planning to do for the longest time. So we'll see if I actually have to balls to cut my hair.